Let’s perhaps take a minute to review how far we’ve come. Late in the twentieth century, a consensus arose that Modernism was dying, if not already dead. This is not as sad as it sounds: the first artist to be called modern was Dante, and he’s also dead. The first modern art movement was said to be the high gothic, and they’re all dead, too. By the way, these were not called modern by their contemporaries, but by ours—or nearly so. It was in the twentieth century that modernists began to identify modernism among earlier cultures: in essence, like humans everywhere, to seek out their ancestors. So the end of one modern art is like the death of a king, who will be followed by another. Modern art is dead: long live modern art. So what did we say to each other, late in the twentieth century, when we saw our modern art coming to a close? We said that with it, history was coming to an end—or at least history was undergoing a sea-change of historical proportions. Since we now knew enough to see the broad sweep of history at once, we needed no longer be its victims. We could position ourselves anywhere in the past, and try to see their world as they saw it, even while we kept one foot in our own time. And that meant we could legitimately borrow from all of art history, mixing and matching techniques and styles. It was a great time for irony, as today’s judgments were dressed up in the manners of the past, or past values were placed in new vessels. 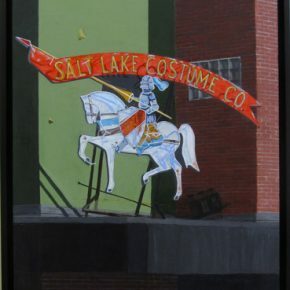 Enter Waldo Kidd, with some of the more sophisticated painted images to be seen in Salt Lake galleries. 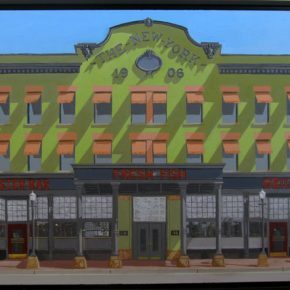 The urban landscapes and vegetable portraits on display upstairs in Charley Hafen’s appropriately historical, brick-and-glass commercial building may appear nostalgic to the insensitive viewer, but they are nothing of the sort. Nostalgia isn’t simply about the passage of time; it’s about loss. That worn-out Wyoming ranch house, with its shingles sunburnt and warped until the rafters show through, it’s siding seemingly still standing only to justify a magazine article on dry brush watercolor technique, may have been built the same year as the one in the photograph on the next page, advertised as the finest B&B in Cheyenne. What makes the first compelling in a way the second is not has to do with its temporal inaccessibility: like a scale model, like a toy, like a work of art (which it is), we can reach it fully, in all its implications, only with our minds. We cannot know the future of the B&B in the way we know the ruin’s past. No more nostalgic than your average contemporary painter, what Waldo Kidd wants to do is nothing less than paint the present moment into the past, thereby preserving both into the future . . . though it’s unlikely he’d describe it that way. 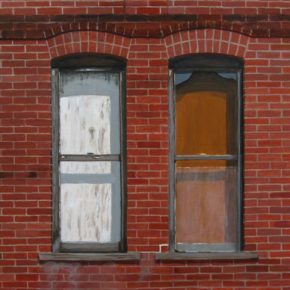 Yet consider one of his more readily accessible images: in “Windows On The Past,” the four subjects, despite the implied promise of the title, fail to admit us past their peeling sashes, the building having been carefully boarded up with (meticulously rendered) plywood. The care shown might reveal the difference between being merely derelict and truly abandoned. One might just as well say that if the brick building with arches in place of lintels represents the past, these windows are precisely, as the title says, ‘on’it, and their individual testimony is all the evidence they have to offer. Twenty years after the vaunted ‘end of history,’when ideological evolution was supposed to have ended and all time become one, Kidd’s image replies that the past is just as much a mystery today as it ever was. go the windows across the facade, ‘rubato’ bringing the middle two closer together than the outside pair, while accident-prone wooden sashes and glass build the melody. No two bricks or sections of mortar have aged the same over the decades, any more than you and your siblings look as alike today as you did when you were children. In place of the phoniness of modern brick, usually a thin veneer of identically pre-aged, glued-on biscuits, Kidd captures patina, a texture comprised of equal parts skilled labor and the passage of time. For all its depth and layered meaning, “Windows On The Past” is a sonata, as are “Subway” and “Red Pipes.” To partake of the full resonance of urban landscape, move on to “Tattered Warrior,” which most 15 Bytes readers will recognize. Where many of us seek out redundant scenes of nature for feelings of permanence—it making little sense to talk about the ‘survival’ of Mt. Olympus, and no sense at all to discuss its ‘changing role on the city’s skyline’— here Kidd captures a story of survival, new purpose, and evolving meaning that, while true of this antique neon sign, is equally so of every element of the surrounding urban landscape. We cherish nature to the degree it is not like us; our cities, on the other hand, are like us because made by us. What makes these paintings truly satisfying is how well they work simultaneously on contrasting scales. While the painter’s details convince the animal eye that is intimately familiar with the city—with streets and signs, cars and parking, retrofits like electrical wiring and remodeling—the artist’s overall designs delight the mind’s eye with their sensuous balance. Whether in the receding cubes of “Moochie’s” or the undulating verticals of “Evening NYC,” the horizontal expanse of near and far in “Night City,” or the cultural history lesson of “The New York,” through the art the chaos of barely regulated life yields up visions of unanticipated beauty. While he places his buildings where he finds them, in ensembles, Kidd comes to his fruits and vegetables from the opposite direction. While he calls them still lifes, he also admits to removing them from context in favor of contrasting, solid colored backgrounds above which they appear to float. 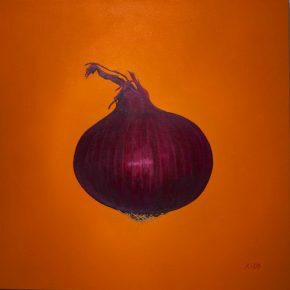 Though like icons, portraits are closer to the point: through the same features as any other “Onion” or “Napa Cabbage,” we see here the unique individual among the infinite variation and profusion of nature. 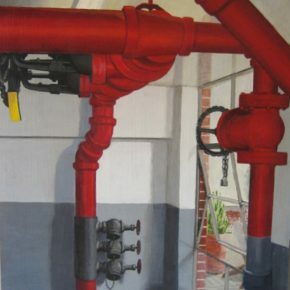 Perhaps it would not be minimizing Waldo Kidd’s vision of our world to say that he paints what he sees, and really for the most part what we all see. Instead of valuing nature as an alternative, a place to escape to for the weekend while lodging in Moab or St. George, he urges contemplation—and appreciation—of the environment we actually build, and the roles nature plays within our choices. As the human species increasingly opts to build and inhabit cities, it falls to our contemporary arts to influence how we both make and dwell in them. Note: As they climb the stairs, those visiting Waldo Kidd’s current exhibition at Charley Hafen’s should look closely at Juan Pablo Gasca’s abstractions, held over for another month. In their massive, architectonic power, these cubic inventions sometimes suggest machines, at other times ways of thinking, and they form a natural kinship with the cityscapes above. 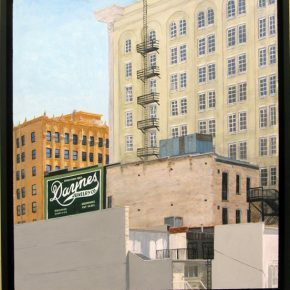 Waldo Kidd :Contemporary American Realist Painter is at Charley Hafen Gallery in Salt Lake City through September 13.